Tile-based interface of Windows 8 often creates confusion for users accustomed with regular operating system navigation pattern. The biggest problem for a new user is the absence of good old start menu in Windows 8. This creates a problem in navigating and opening new applications. There are several good applications that can be used to add a classic start menu within Windows 8. This way, you can easily browse and access all important links within your desktop. These utilities are light and seamlessly gel the start menu without creating any kind of hindrance. I've tested all these 7 applications and found them free from any kind of malicious software. They may differ slightly in the features they're offering, but overall they all give you a perfect start menu for your Windows 8 desktop. If you do not like the start menu at a later stage, you can easily remove these applications to revert back to the regular tile interface. 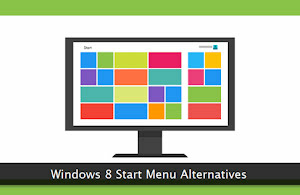 Start8 - This is one of the popular applications to add a handy start menu to your Windows 8 PC. This powerful menu lets you pin metro, system and desktop applications within the start menu. This way, you can easily access all the important apps without any hassle. Its powerful search box lets you query for applications, files, and folders. You can easily adjust and configure the menu size to match your screen dimensions. You can also use various skins for the start button to gel it with your desktop wallpaper. Pokki - This lightweight application provides you with powerful and feature-packed start menu for Windows 8. Like other apps, this one also provides a powerful search box to find different types of resources on your system. You can directly skip the starting screen while booting through this application. You can also disable hidden sliding menus around the desktop for better navigation. It's not just the start menu, but you also get tons of free utilities and apps along with this software. Classic Shell - This popular software adds a classic Windows menu to your Windows 8 system. You can easily organize applications within the menu simply by dragging and dropping them at the appropriate place. It is available in dozens of languages and is used by large number of people across the globe. It comes with several skins and also supports the integration of 3rd party skins to customize the appearance as per your requirements. You can use this software both for 32-bit and the 64-bit version of Windows 8. ViStart - This menu application provides large collection of skins for the start button. Its unique 'Ultra Blur' feature gives stunning visual appearance to the start menu without putting any load on system resources. Its auto complete feature helps you launch applications immediately. You can also find files and folders through an integrated search box. It also includes links to all important system folders and applications for tweaking your desktop settings. Power8 - This open source project provides you with clean, unobtrusive and powerful start menu for Windows 8 systems. It doesn't alter the existing system files for its working and runs separately without any glitch. It includes sleep, reboot, restart and other important buttons within the menu. It has lots of configuration options to customize the menu's appearance, working, and behavior. It also has the classic programs submenu to let you browse and start all the installed applications and software on your system. StartFinity - This clutter-free application brings all the features of a typical Windows start menu to your Windows 8 computer. It has all the important links like programs, control panel, documents and much more. You can also use its search box to find your favorite applications quickly. You can also change the size of icons and text from the customization menu. This software automatically detects the primary language of the system and presents the start menu in that language. Windows 8 Start Button - It is one of my favorite start menu applications that are lightweight and works with all major versions of Windows. It comes with several skins and runs independently without altering critical system files. It can also take advantage of a dedicated GPU or a multi-core & multi-threading processor to give you a lightning fast experience. You can also customize frequently used power buttons for easy access to important system tools.